Here is a song by the very rare and almost mythical singer Ethel Azama. 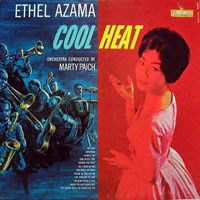 Hawaiian-born, of Japanese origin, Ethel Azama (1934 - 1984) is a jazz vocalist who recorded sessions with the Marty Paich orchestra in 1960, from which resulted one album for Liberty, "Cool Heat". 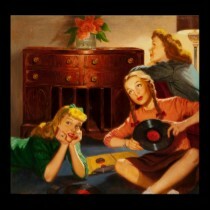 Martin Denny produced her, recorded in Honolulu and wrote liners of her other LP, "Exotic Dreams" (the cover featuring Martin Denny's model Sandy Warner). She also appeared with Arthur Lyman in the early 1960's, and her version of "Lullaby of the Leaves" can be heard on the "The Leis of Jazz". She was also an actress who appeared in the TV-series "Hawaii Five-0" in 1975 and 1976. Enjoy this exotic trip to Hawaii! 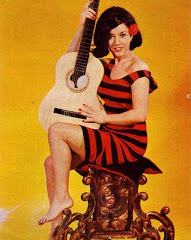 And here is another interesting performance of Ethel Azama from 1963.